When you've cut your finger or a stuffy nose is keeping you awake, the last thing you want to do is search high and low for a Band-Aid or decongestant. 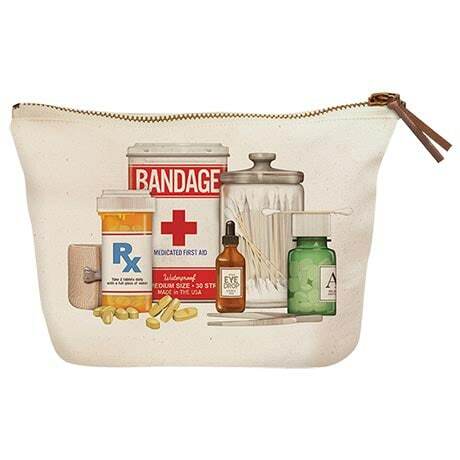 Instead, be prepared for whatever scrapes and sniffles life throws at you with our cute Medicine Cabinet Zipper Pouch. Measuring 7¾"x8½", this natural canvas, zip-top bag is the perfect size for corralling loose bandages, alcohol wipes, and cotton swabs in your bathroom or packing your prescriptions and first-aid supplies while traveling. You might even say it's just what the doctor ordered!